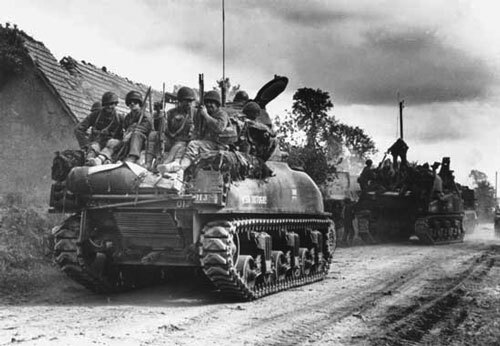 It is 70 years since the momentous events of June 1944! This campaign is the result of 18 months development work and play testing to deliver a tournament game that aims to trace the first five weeks following the sea and airborne invasion of Western Europe in June 1944. Thanks are owed to many and those acknowledgements are in the handbook. In addition to the Canberra Flames of War Group, I am particularly grateful to both Phil Yates and Jokull Gislason who have contributed much to the development of this campaign over these past many months. Phase 1. D-Day 6 June. Played as a series of ‘Hit the Beach’ and ‘Seize and Hold’ missions. These are described in the handbook and should be adapted to suit local situations. There are two options for the impact of these games on the main tournament or second phase. Phase 2. Main Tournament. Designed to be played over five rounds and each round comprises a week culminating in the fifth week post invasion from 7 June to 15 July. This campaign is designed to be flowing where the Generals take command from Round 1 and through the supply and reinforcement build-up, make strategic decisions around capturing key ground, denying enemy exploitation routes or attempting sweeping flank attacks. 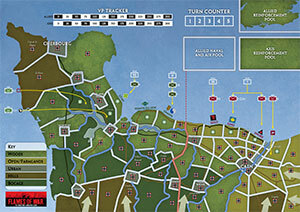 A deliberate inclusion in this game is the full use of Warriors as additional firestorm units; both Allied and German. They can often be the key to an unlikely victory! Firestorm Overlord has been heavily influenced by Firestorm Bagration and Firestorm Market Garden and there has been no attempt to re-design the game mechanics found in those campaigns. Rather, the special rules found in this handbook are designed to shape the operational conditions experienced during the invasion of Normandy. Firestorm Overlord is the Invasion of Western Europe on a grand scale using forces from the D-Day compilation: Overlord and Atlantik Wall. 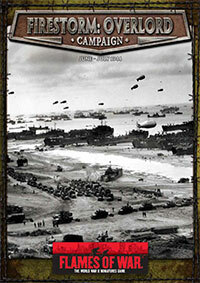 The campaign can be played in smaller campaigns by excluding D-Day and commencing on D+1 or using only the British or US sectors. In whatever form you play this in, it will be fun and challenging. 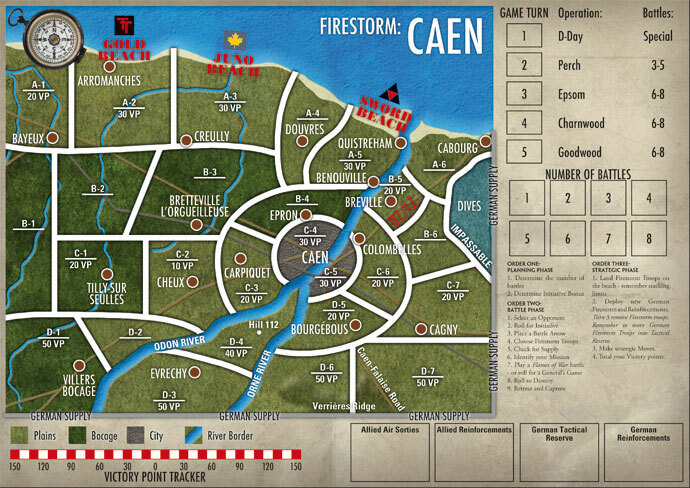 Firestorm: Caen focuses on the British and Canadian landings on Gold, Juno and Sword beaches right up to Operation Goodwood. It is a full-sized campaign but has special rules for smaller groups or even a two-player option. There are five turns in all, each named after the major operations for each time period; Neptune, Perch, Epsom, Charnwood and Goodwood. Covering the period between 6 June to 20 July 1944.